Yes, you can still use your tractor-feed paper! This USB to 25-Pin Parallel (LPT/Printer) adapter cable allows you to run old printer via a regular USB socket! All you need is a PC with a spare USB port and some version of windows from the last decade. You may also need the right drivers for your printer, but that's about it. The cable itself is plug-and-play, and nine times out of ten generic drivers will be fine for basic printing needs. It's the easiest way to work with old parallel printers on modern Windows-based PCs and Laptops! Your heading says 25 pin and then the descriptive writing says 24 pin. will this run a parallel printer under windows 7? Answer: "Opps! Typo. It's definitely 25-pin, just like any standard LPT socket. And yes, this product is designed to get older Parallel printers going on newer USB-ready computers. Windows 7 is pretty clever about recognising older printers, but in some cases third-party drivers are needed and can be hard to come by depending on the brand of printer. If in doubt, try searching on Google for your printer model number + "parallel to usb" and see if others have had success. Otherwise, we do have a 30-day satisfaction guarantee so you won't be stuck with your purchase if it doesn't work." Answer: "This device does not include drivers, as Windows contains generic plug-and-play drivers to access the adapter. Device drivers for the attached printer may be required, however, and will only be available from the original printer manufacturer." Answer: "Yes. 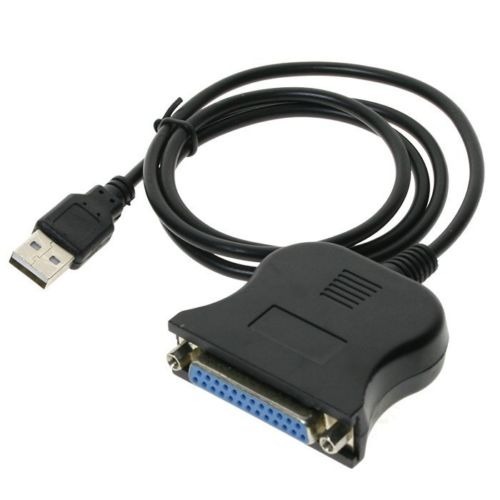 Windows 8 still contains its own generic drivers for USB to Parallel cables like this one. However, your printer may also require drivers in addition to those required by Windows to use the cable. Finding device drivers for very old equipment can be difficult."